Do You Want to Retrain Your Brain to Think Healthier Thoughts? 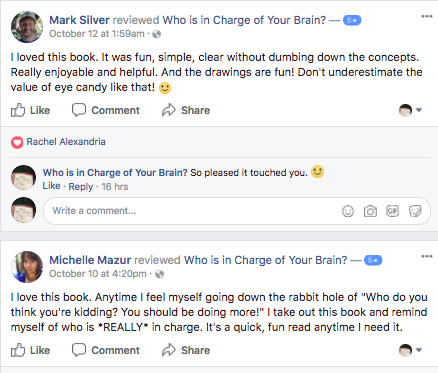 Last year we dropped Who is in Charge of Your Brain? into the world and your feedback was overwhelmingly positive. But then I started hearing from enthusiastic readers that they wanted a follow-up. The book is just a wonderful taster, and they crave a next step into more mindfulness and ways to release judgment. You receive a month’s worth of simple lessons, inspiration, new tools for mindfulness, and support to become your own best friend — all for the cost of nothing. Seriously. I personally wrote every day’s challenge, and a number of them also include a free guided meditation or video class by me. Other than a few resource links at the bottom, there’s also no sales pitches. You simply get 30 days of guidance to follow up on what you learned from the book. Join hundreds of others who are improving their minds and creating healthier thoughts for a happier life.